Save money on braces wax with a bulk box of 50 containers of traditional unscented, unflavored clear dental wax. The first weeks in braces can be rough! Using this wax helps to protect your lips and gums from your brackets, so you can feel more comfortable. High quality - compare to the leading brand! The containers come in an assortment of "tropical" colors. And, at less than 60 cents per container, you enjoy comfort and great savings! Please note that dental wax is not returnable due to health regulations. Want a smaller amount? Click here for a 10 pack! Each box contains 50 containers of dental wax. The wax is opaque and unscented/unflavored. Also available in smaller 10-packs. When you first get braces, or if you have a lot of hardware in your mouth, dental wax can be a Godsend. Just smoosh some onto the bracket that is causing irritation, and it forms a barrier between your bracket and your gums. The wax we carry is high quality and made right here in the USA. 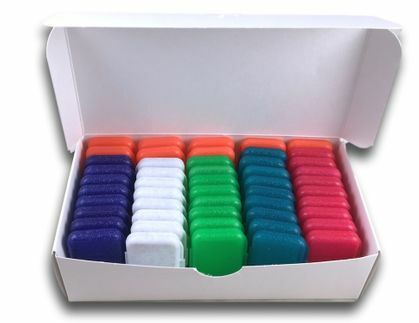 Tooth Colored Wax - Bulk Box of 25 - NEW! Great price, set for life. ProsGreat price I haven't had any mouth sores since getting these Never leave home without one! I like the wax because it isn't mint flavored like the ones in the retail stores. Plus it was priced to save me money. Excellent value. My daughter should be set for wax for the entire time she has braces now. I know when I had mine it cost me a fortune buying wax one pack at a time! Love it. No artificial scent. This wax has no artificial mint or whatnot scent and that is why I ordered it. It is completely scent-free. Little boxes are so cute and convenient to put in your purse or pocket. It is a life saver for my braces or I would not be able to eat, drink, nothing. Loving this product, it stays in place and I really like that it has no taste in the mouth as I'm not a fan of mint flavour. The markup at local drugstores is shameful, not to mention the constant trips. This is an awesome product with enough quantity to bring peace to our day! I use this product almost every night. I have springs on my front teeth that dig into my gum and this product works fantastic! The stuff I got from the ortho does not work anywhere near as well as this product. I've also tried some from the store and don't like it as much either. This stays on and most of the time I have to remove it, unlike others that fall off and have to be replaced.